Spensa’s Father was not only accused of deserting his Flight and turning his back on the colony but, also attacking them too. Leaving a life of mistrust and difficulty for his wife and daughter, in place of the perfect eutopia they once enjoyed. Now, not only being considerably ‘strange’ but, also the daughter of a traitor, her father ensured that growing up, Spensa was a social outcast, all the other kids her age shunning her, for something her father may, or may not have done. What happened to writing your own destiny? and everyone being an individual responsible for their own actions? With her father now gone and her mother working all hours to support her, Spensa has no one to comfort her but, her ancient Grandmother. Being part of the crew which originally crashed on Detritus, her Grandmother still has vivid memories of the old home of human civilisation, Earth. With nothing else to do her Grandmother provides Spensa with entertainment necessary to pass the time, should she need it. Fueled by her Grandmother’s stories from Earth and it’s ancient heroes, Spensa has dreamed for years of proving herself and restoring her father’s honour, just as the heroes of old would have. Every single waking moment Spensa, has spent preparing and studying the material necessary for her to pass the entrance exam to flight academy, beginning on the road to her Father’s redemption and the restoration of his and their families’ honour. The only problem is the Academy don’t want the chaos of a traitors daughter as one of their cadets. It simply isn’t feasible. Now, with the news that even with a perfect score, Spensa may not make it into the Academy, any little resolve that was holding her together begins to fall apart. Her one motivation in life a lie. So, the question is, will Spensa be able to hold it together and attempt the test, no matter how small the odds are for her to pass? Or will she crumble and abandon her life’s ambition of being a pilot like her Father? 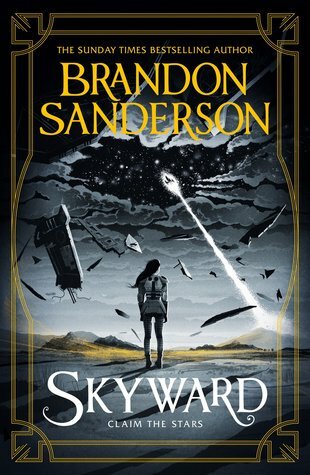 TEEN OVERVIEW: I literally don’t know how I will possible survive the months until October of 2019, when ‘Starsight’, the prequel to Skyward, is set to be released. I literally can’t wait. Absolutely sensational work from Sanderson, especially when in comparison with his previous novels. Sanderson consistently smashes any notion of a level for an incredible novel and sets the bar higher than previously even thought possible.